We voted this morning. 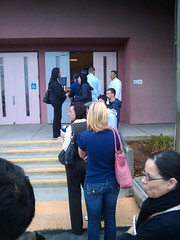 We arrived at 6:40AM to a small line and were in and out in no time once the polls opened at 7. The rain started shortly after we got back into the car, thank you to the sky for holding out for us! PLEASE get out there today and vote. It’s an honor and privilege we have as Americans, don’t take it for granted! No matter who or what you vote for, just do it, let your voice be heard!